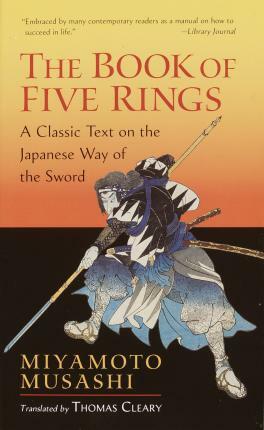 The Book of Five Rings is one of the most insightful texts on the subtle arts of confrontation and victory to emerge from Asian culture. Written not only for martial artists but for anyone who wants to apply the timeless principles of this text to their life, the book analyzes the process of struggle and mastery over conflict that underlies every level of human interaction. The Book of Five Rings was composed in 1643 by the famed duelist and undefeated samurai Miyamoto Musashi. Thomas Cleary's translation is immediately accessible, with an introduction that presents the spiritual background of the warrior tradition. Along with Musashi's text, Cleary translates here another important Japanese classic on leadership and strategy, The Book of Family Traditions on the Art of War by Yagyu Munenori, which highlights the ethical and spiritual insights of Taoism and Zen as they apply to the way of the warrior. "The Book of Five Rings is one of the most insightful texts on the subtle arts of confrontation and victory to emerge from Asian culture. Written not only for martial artists but for anyone who wants to apply the timeless principles of this text to their life, the book analyzes the process of struggle and mastery over conflict that underlies every level of human interaction. "The Book of Five Rings was composed in 1643 by the famed duelist and undefeated samurai Miyamoto Musashi. Thomas Cleary's translation is immediately accessible, with an introduction that presents the spiritual background of the warrior tradition. Along with Musashi's text, Cleary translates here another important Japanese classic on leadership and strategy," The Book of Family Traditions on the Art of War by Yagyu Munenori, which highlights the ethical and spiritual insights of Taoism and Zen as they apply to the way of the warrior.